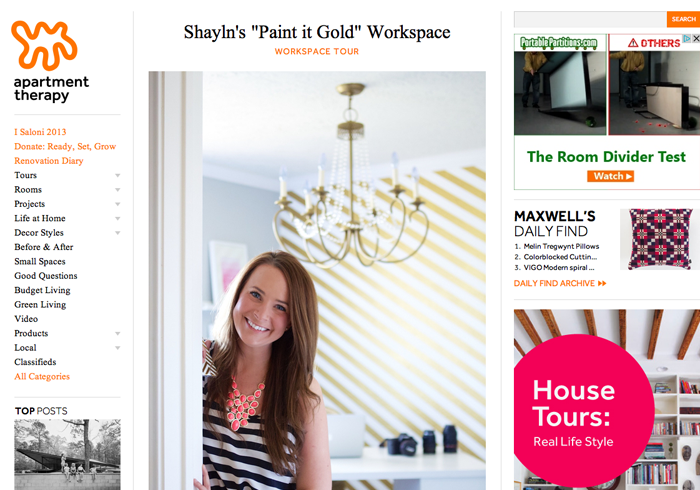 So Shay: Apartment Therapy Feature!!!! PINCH ME. Apartment Therapy Feature!!!! PINCH ME. I can't even tell y'all how excited I am right now. I was scrolling through my Facebook feed when I saw my face sitting there "just chillin" smack dad under "APARTMENT THERAPY!" Talk about a smile bigger than the Grand Canyon, a dance bigger than Beyonce, and a heart feeling more full than EVER. I have adored this blog for years...and I just can't believe my lil' ol' office is being featured. SO thankful. SO blessed. TOO stinkin' excited!!!!! ShareApartment Therapy Feature!!!! PINCH ME. You deserve this lovely! So happy for you! Congrats! Your office space is Ahhh-mazing! I love it. That gold accent wall is to die for. I love that you created such an amazing space on a budget. It's definitely inspiring. I have seen your office over and over again and i STILL love it!!! Congratulations! So just wondering if you got my last comment, wondering who was singing in the background of the video you made of your adorable grandparents! I REALLY want to know who it is! Congrats girl!!! This is amazing! This is awesome, congrats girl!! Um amazing! That gold trunk I can not get enough of!!!! I need a recommendation. I have a rebel t3i and I love it but I need another lens. Something that's longer distance. Any suggestions ? That is so cool! Congrats!!! Absolutely love the feature and your gold wall!! Beautiful! This is so amazing and exciting!! Congratulations Shay! I absolutely LOVE your office space... Omg those walls!!!!! I also have those l-o-v-e letters on your bookshelf, did you get them from Target? Those frames/prints behind your desk, did you make those? It looks like there's some type of design on the glass? Everything is so pretty and perfect! This is so exciting!!! Congrats girlfriend!!! I loved your feature Shay, your space is so inspiring!